Gold Makes History ! - Capitulation ? Hedge funds are holding the first ever negative net position in gold futures since the U.S. government started collecting the data in 2006. The funds and other speculators shifted to a net-short position of 11,345 contracts in New York futures and options in the week ended July 21, according to figures from the U.S. Commodity Futures Trading Commission. Is this capitulation at the bottom of a massive 3 year correction ? What does this mean ? If you overlay their net position to the gold price something rather alarming jumps out (which actually common sense would dictate). Rather than focus on the peaks let us look at the low net readings. So everytime you have a net low reading its lead to a substantial rally, even in the bear market of the last 3 years ! Now they are net-short, so they have been net-long from 1900 down to 1100, gone short for the first time in history below 1100. This is certainly lending support for a substantial rally. This next chart is the NET POSITION of the largest group of speculative forces in the markets today and that is the Hedge Funds. Overlaid upon that graph is the price of gold. Notice how precise the movement of the speculative Hedge Fund category is in relation to the gold price. As their net long position increases, the price of gold rises. As that same position falls, so too does the price of gold. The relationship is absolutely perfect. So taking this historic moment in history with hedge funds being net long all the way from $1900 to $1100 and have now gone net short , what does the actual real world physical buying of Gold look like ? 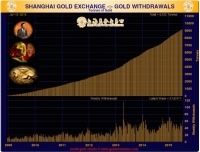 Gold withdrawals on the Shanghai Gold Exchange the past two weeks were larger than the amount of gold delivered on COMEX during 2014 and greater than the amount of gold Germany has repatriated from the New York Fed since 2013. The Shanghai Gold Exchange (SGE) delivered 61.824 tons of gold during the week ended July 10, 2015. The prior week the SGE delivered 44.335 tons of gold. The two week total is over 106 tons of gold delivered and the year to date total is over 1,269 tons, for an annualized run rate of approximately 2,400 tons. Along with India, China consumes much of the world’s gold. Depending on any given month, either China or India is the number one gold consumer in the world. Together they account for approximately 3,000 tons a year in gold demand. That is just India and China alone consuming near 100% of present global production ! This global production decline could actually fall by over a third, as we have written about here. 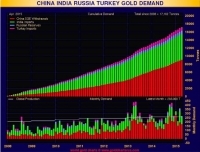 So we have the hedge fund community net short of Gold futures for the first time in recorded history, while the world demand for physical gold is hitting new highs of over 100% of global production and then you have the production of Gold forcast to be falling off dramaticaly over the next few years.